Business intelligence software is supposed to help businesses access and analyze data and communicate analytics and metrics. I have witnessed improvements to BI software over the years, from mobile and collaboration to interactive discovery and visualization, and our Value Index for Business Intelligence finds a mature set of technology vendors and products. 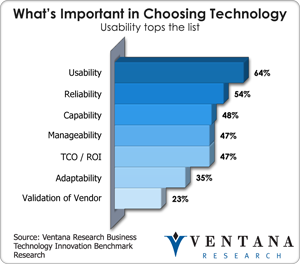 But even as these products mature in capabilities, the majority lack features that would make them easy to use. 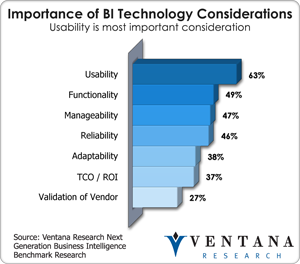 Our recent research on next-generation business intelligence found that usability is the most important evaluation criteria for BI technology, outpacing functionality (49%) and even manageability (47%). The pathetic state of dashboards and the stupidity of KPI illustrate some of the obvious ways the software needs to improve for businesses to gain the most value from it. We need smarter business intelligence, and that means not just more advanced sets of capabilities that are designed for the analysts, but software designed for those who need to use BI information. Business analytics have become mainstream in most organizations. 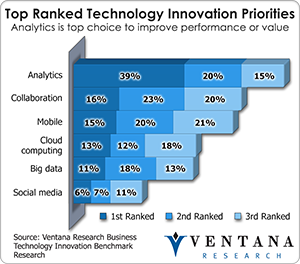 Our latest research in technology innovation found analytics was the top-ranked technology in 39 percent of organizations. To deepen the sophistication of their analytics, businesses can add geographic context and maps to business intelligence applications to create what we call location intelligence. Applications and tools with a geographic and spatial context can help deliver new and deeper insights to business. Information about location or geography can improve the quality of actions, decisions and responses to opportunities, and enable organizations to understand more about their customers. It also can help companies gain critical business insights, make better decisions and optimize performance and processes. It can benefit marketing, customer acquisition and retention efforts; logistics and supply chain management; and financial and operational decisions, especially about where to place retail outlets, business assets and people in various functions. Managing data efficiently across the enterprise continues to be a large challenge for both business units and IT. Organizations need data supplied in a consistent format and timely manner to help manage their activities and processes, but some do not look beyond conventional approaches to improvement. Today’s large volumes of data make it more difficult to understand the relationships among data and the role of location-related data. 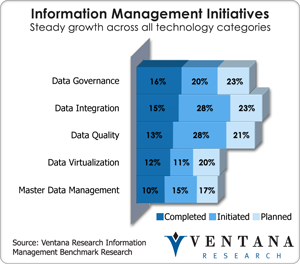 Our 2012 benchmark research on information management found that most organizations need to advance their data initiatives and take steps to integrate them. Splunk’s innovated ability to access and use machine data for targeted operational insights can help improve IT and enhance business operational efficiency. 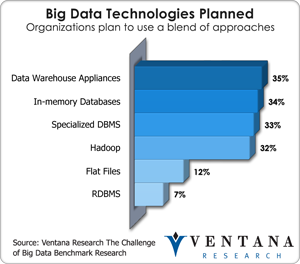 Its work to capitalize on big data was part of my last analysis, while my colleague Tony Cosentino looked at its focus on search and operational analytics. Splunk also was a recipient of the 2012 Ventana Research Technology Innovation Award for IT Performance for Splunk Enterprise.